Sitting in the navigator seat right now on the way back from a trip to New York, I am still laughing about what I just did. Let me start out by saying that I am not a holier than thou member of the food police. Anything but. I lost 75 pounds by changing my relationship with food. I was aided by lap band surgery two and a half years ago but I can tell you that was an aid, not an answer. The answer was viewing food from a different perspective. Food has no power yet I used to assign it a personality complete with a voice I could not resist. Food ruled my world. I thought about it all of the time. I didn't always eat bad food, just way too much of it. I think the turn around happened when I accepted the unknown future of eating after surgery. I really did not understand how my new digestive system was going to effect my food choices. I accepted the real possibility that I would no longer be able to eat pasta. That was a major leap for an Italian American who was not only raised on it but fed it to her family several times a week. There are a few things I have not successfully added back into my life. I have not had a beer in two and a half years but don't cry for me Argentina. I still drink wine and cocktails. Caution there though because cocktails are loaded with calories. It's the carbonation I avoid so pop, even diet, is not on my menu. Big bulky bread sub sandwiches or piled high burgers don't get my attention but a burger without bread is still yummy. I don't eat much pizza these days but thin crust is my choice when I do. I am happy to say that I have added pasta back into my menu, but the size of my bowl is considerably smaller than before. It's harder than it used to be to eat fiber rich food because it uses up a lot of the smaller space. But I need to, no question about that. But why, you might ask, did I start this post out by saying I was laughing at myself? Because even after my whole "aren't I awesome because I have a better attitude about food" thing I was just spewing I still sucked into the junk food trap. I went into a convenience store somewhere in Pennsylvania and bought a few bottles of water. The drinks we brought from home were gone so we needed to reload. 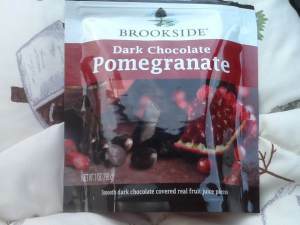 I also purchased a bag of Combos (hubbies request) and dark chocolate covered pomegranate seeds. The pomegranate seeds were merchandised next to "organic" this and "healthy" that so instead of reading the label I picked them up thinking that my husband could eat the junk while I enjoyed pomegranate. Good girl! Um...turns out, whoops. And that's why I'm laughing. Bag #1 - 1/4 cup serving (about 5 per bag); 180 calories. 7 grams fat. 1 gram dietary fiber. 1 gram protein. Bag #2 - 1/3 cup serving (about 6 per bag); 130 calories. 5 grams fat. 1 gram dietary fiber. 2 grams protein. And, yes, the Combos are item number 2 (fewer calories, larger portion size, less fat and more protein). Yikes! One last thing. I no longer believe you can "cheat" with food. It's just food. It's not good or bad. If you make conscious decisions about it every day and choose foods that balance your diet with protein, fiber and nutrients you can fit in anything that pleases you. Just keep the stated portions in mind when you make the choice. So yes, read the labels. Then, when you decide you want some junk, just go for it! It's only food.